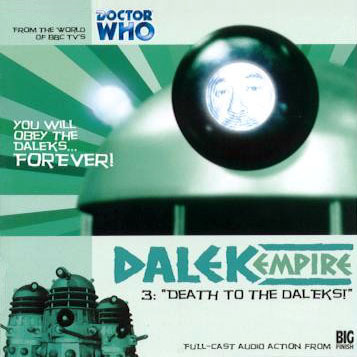 Dalek Empire - Death to the Daleks! This is part 3 out of 4 of the first Dalek Empire series. This has nothing to do with the Third Doctor serial Death to the Daleks. Didn't you notice the exclamation point? "Suz decides it is time to take control of events. But when she is summoned to an audience with the Dalek Emperor, she begins to fear that all her efforts have been in vain. Meanwhile, Earth Alliance Security commander-in-chief Tanlee is intent on locating Alby. The Dalek advance across the galaxy seems unstoppable and the only possibility of salvation for the human race lies in the Lopra System. But how can Alby help, when no one will tell him the purpose of 'Project Infinity'?" What did you think? Are you pumped for the finale? Seriously, why didn't they call this Death of the Daleks? Another cliffhanger! DUN DUN DUN. But this one is less so because when you've been hearing from what seems to be a future version of someone it sort of gives you faith they aren't going to die. This seems to be the transition before the big finale, there's a lot packed into this one but I didn't have as much fun with it as the first two. But the revolution has begun and everyone's all ready to kill those pesky Daleks. The 4th part of this should be a blast. One of my favorite parts in this is when the Daleks are talking to Suz and Kalendorf about whether or not their relationship is 'efficient.' Otherwise, he should obviously be exterminated. The Daleks really don't have any comprehension of the way humans work either, their whole focus is on efficiency, efficiency, and some more efficiency. I could never imagine being at odds with someone and being asked if my relationship with them is "efficient." It's an impossible question to answer. I think the Daleks' lack of human understanding usually ends up being their downfall. They try to understand it, but never quite get all the way there. so by now it's been many years since the serial started, but not quite sure how many and what's happened. we do know that Suze is now famous across the galaxy as the Dalek's Angel of Mercy, i.e. slave representative and ambassador to the Daleks. She had ordered the death of fellow slaves in the previous episode to keep the Daleks from finding out about her and Kahlendorf's secret plans to attack the Dalek Empire from the inside out. but when she realizes she's lost control over the Daleks, things speed up and pretty soon we're at the end of the episode where she's addressing all slaves to the Daleks, along with pretty much the rest of the Galaxy (those few places not yet conquered) and she gives the secret command, "death to the daleks" a command/plans spread through the rest of the slave by help of the psychic Kahlendorf. Meanwhile there's Alby going around and getting into trouble and drinking and whatnot, but eventually he finds himself actually assigned to find Suze and kill her if she knows anything about Project Infinity, a plan the Daleks must never find out about from some reason. I found this one harder to follow for some reason. The police person was getting on my nerves. Theres a huge war going on and countless people are dying and here she is concerned with what Alby did years ago. I cant wait to see how it ends. And agreed, the cliffhanger doesn't work when shes been narrating to us.